This recipe calls for unwashed bitter leaf. If you find this a little daunting, you may start with washed bitter leaf and gradually incorporate more of the unwashed leaves as you get more used to the taste. In a blender, combine the bitter leaf with 1 cup water. Blend for 2-3 minutes to extract juice. 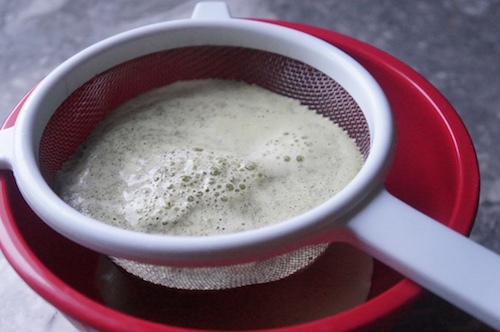 Place a mesh strainer over a bowl and pour in the puréed leaves to collect the juice. Discard the resulting chaff. Use a spoon to scoop off any foaming residue that collects on top of the collected juice. In a medium-size container, combine the bitter leaf juice, milk and honey. Stir well to combine. Serve over ice or at room temperature.